In this annual study of job retention and creation by the 50 states and the federal government, Brent Pollina, Esq. emphasizes the effort to make America more business-friendly must come from all levels of government. Many states are doing such a poor job of creating a pro-business environment that they can’t even come close to competing with each other, much less compete globally. The way business is conducted in this century is significantly different than it has been in the past. The question is: How is American business and government adapting to these new economic realities? The annual Pollina Corporate Top 10 Pro-Business States study finds that the federal government and many state governments continue to offer little or no assistance to business to promote job growth. 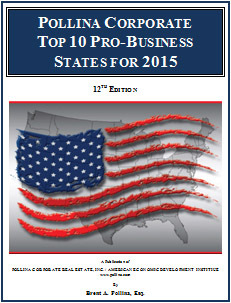 The Pollina Corporate Top 10 Pro-Business States study examines over 30 factors relative to state efforts to be pro-business, and is the most comprehensive examination of states available. It has also been recognized as the most impartial. The study is limited to factors over which state governments have control. All 50 states are ranked based on how well they exhibit leadership that truly understands the importance of producing the best business environment and thus the best opportunities for job growth for their constituents. 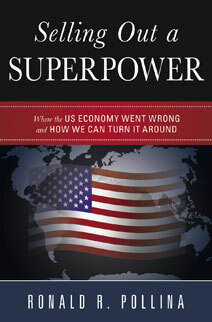 Selling Out a Superpower by Ronald R. Pollina PhD. website by BMF Promotions, Inc.